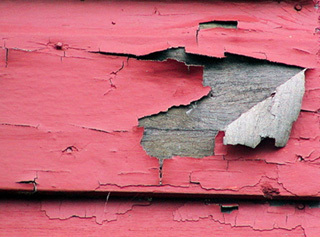 Older homes may contain lead based paint. Lead was used as a pigment and drying agent in "alkyd" oil based paint. "Latex" water based paints generally have not contained lead. About two-thirds of the homes built before 1940 and one-half of the homes built from 1940 to 1960 contain heavily-leaded paint. Some homes built after 1960 also contain heavily-leaded paint. It may be on any interior or exterior surface, particularly on woodwork, doors, and windows. In 1978, the U.S. Consumer Product Safety Commission lowered the legal maximum lead content in most kinds of paint to 0.06% (a trace amount). Consider having the paint in homes constructed before the 1980s tested for lead before renovating or if the paint or underlying surface is deteriorating. Because the early symptoms of lead poisoning are easy to confuse with other illnesses, it is difficult to diagnose lead poisoning without medical testing. Early symptoms may include persistent tiredness, irritability, loss of appetite, stomach discomfort, reduced attention span, insomnia, and constipation. Failure to treat children in the early stages can cause long-term or permanent health damage. The current blood lead level which defines lead poisoning is 10 micrograms of lead per deciliter of blood.